Our Waiting on Wednesday is Matched by Ally Condie which is due to be released November 30th. We just got an email this morning with a NEW exclusive trailer over at i09.com. Watch it here and then be sure to go to the official Matched website starting Friday where you can download the Society Matching application to find your perfect match. Not quite sure how long we will be waiting for this one, but it will be WELL worth the wait…Taken from Kristin Cashore’s blog “Book 3, tentatively titled Bitterblue and currently in progress, is a companion book to both Graceling and Fire and takes place in the seven kingdoms six years after Graceling. As you may have gathered, the protagonist is Bitterblue. Yes, Katsa, Po, and others from Graceling whom I’m not yet willing to name do appear in the book. I don’t know yet when it’ll be coming out, and heartily invite you not to ask ^_^. That’s all I can say about it at this point. EDIT 3/9/09: If you notice on Amazon that Bitterblue is cancelled, don’t worry! The Harcourt edition is cancelled, but only because the book has moved to Penguin. Once Bitterblue is written, it’ll be published by the Penguin imprint Dial Books for Young Readers. You will fall head over heels for Po! To enter to win the hardback: Simply leave us your name and email address! This is not a fun read by any means, nor a feel good fuzzy book. It has graphic descriptions of cutting, suicidal thought and anger. 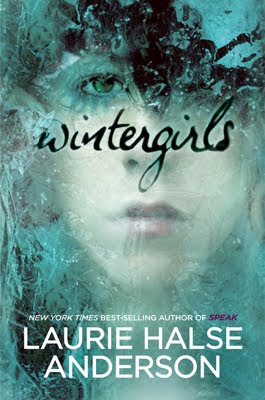 Wintergirls may not be a wise choice for any girls recently in recovery for eating disorders because of triggers to relapse. “There is no magic cure, no making it all go away forever. There are only small steps upward; an easier day, an unexpected laugh, a mirror that doesn’t matter anymore.